When you order one of our beautiful ClanAran sweaters it comes with complimentary gift wrapping, a Certificate of Authenticity and several Heraldic Extras. Leave the gift wrapping to us! 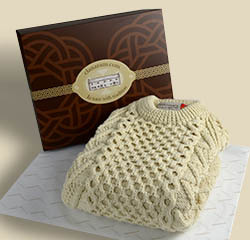 ClanAran Irish Sweaters ordered come in a beautifully presented gift box, carefully wrapped and ready for giving. It adds a very personal touch from us to you! As we know your heritage is important to you, we are “in tune with tradition” as shown by the beautiful Irish harp on the cover. Our special tissue paper keeps your sweater in perfect condition during its travels from the Emerald Isle to your doorstop. The Aran Sweater Market on the Aran Islands, off the West Coast of Ireland is the home of the Aran Sweater. To certify that your ClanAran sweater is a genuine Aran Sweater Market original from the Aran Islands, we have included a signed and stamped Certificate of Authenticity, each with it’s own unique registration number. 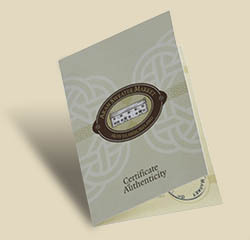 On the back of each certificate is a selection of the Aran Stitches and their meaning. To know what your ClanAran sweater ‘means’ truly makes it a unique family gift to be treasured for a lifetime! We know that everyone is proud of their family and of their roots. 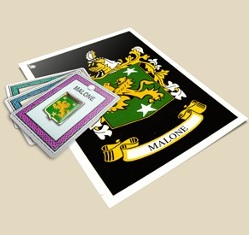 Attached to each ClanAran sweater is a card of your family crest and history. It includes a description of the family crest, where the clan originated, the variants of the family name, the clan motto and the meaning of the family name. Your ClanAran sweater also comes with a high quality enamelled brass lapel pin of your family’s coat of arms to be worn proudly and often! Find out more about your Irish clan heritage & claim a FREE, personalized certificate at IrishClanGathering.com.